When planning an outdoor event, one of the main considerations is the great British weather! When thinking of long, hot summer days with glorious sunshine, we must also think of those windy days with downpours of rain. Another consideration is what sort of impact will your display make? Is your display weather appropriate? 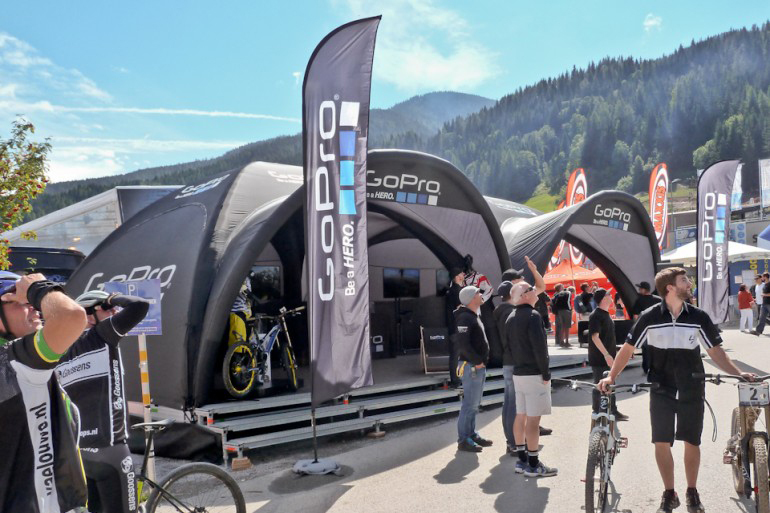 Outdoor events and exhibitions are often filled with row upon row of pop up gazebos, so how do you ensure your brand will stand out? With so many to choose from, how do you select the right one for you? Here at XL Displays, we offer a wide range of outdoor display equipment for a range of different applications and events. First and foremost, you need shelter! Our X-GLOO inflatable event tent is the perfect event tent solution which is guaranteed to make your brand stand out from the rest. Take your brand to the next level with the X-GLOO’s powerful marketing presence. Fully customisable, with a treasure trove of accessories which enable you to make your X-GLOO event tent even more awesome. Link multiple X-GLOO tents together to create a mini tent city, add walls and canopies to maximise your brand visibility. With almost every surface of the X-GLOO being customisable, it’s hard not to be the centre of attention. Available in 4 sizes – 4x4m, 5x5m, 6x6m and a huge 8x8m. The quick set up times, simply assembly and innovative design make the X-GLOO event tent a popular choice amongst outdoor exhibitors. The Signus ONE inflatable pavilion creates an intriguing and eye-catching customer experience. With a sleek design and smooth curves, the Signus inflatable pavilion will make your business stand out from the crowd at any event. The innovative and organic shape means there is no other inflatable event tent like it on the market. The one-piece construction features a clever interchangeable cloth system which allows you to switch your graphics effortlessly for different events. The Signus ONE inflatable pavilion can be used both indoors and outdoors for all types of experiential marketing events. Available in 3 sizes – 4m, 5m and 6m. The unique two-layer cloth system provides a versatile solution for outdoor event marketing. Choose to use both layers with the branded cloth on top, or you can remove the branded cloths which reveals the white waterproof cloths which are zipped in underneath to create an unbranded appearance. Easy to assemble, simply inflate using the electric pump in approximately 10 minutes. Once inflated the Signus ONE takes its unique shape and provides a sheltered space which is perfect for experiential marketing and hospitality events. Branded gazebos are without a doubt one of the most popular choices for outdoor event. Chosen for their stability and durability. We offer a range of sizes with the options of printed full walls and half walls. The hardwearing aluminium frame is strong and stable. Portable pop up gazebos provides the ultimate shelter, whatever the weather. The dye-sublimation printing process produces high-quality full-colour graphics which are perfect for maximising your brand visibility at any outdoor event. The printed walls are attached using a hardwearing strong Velcro, choose to show your printed artwork on the inside, or outside of the tent, simply turn the graphic round to suit your event. Our new range of inflatable advertising products offer your brand maximum visibility and event presence. Our inflatable arches are available in 5 sizes – 4m, 6m, 8m, 10m and 12m - and 3 shapes – round, rectangular and angled. 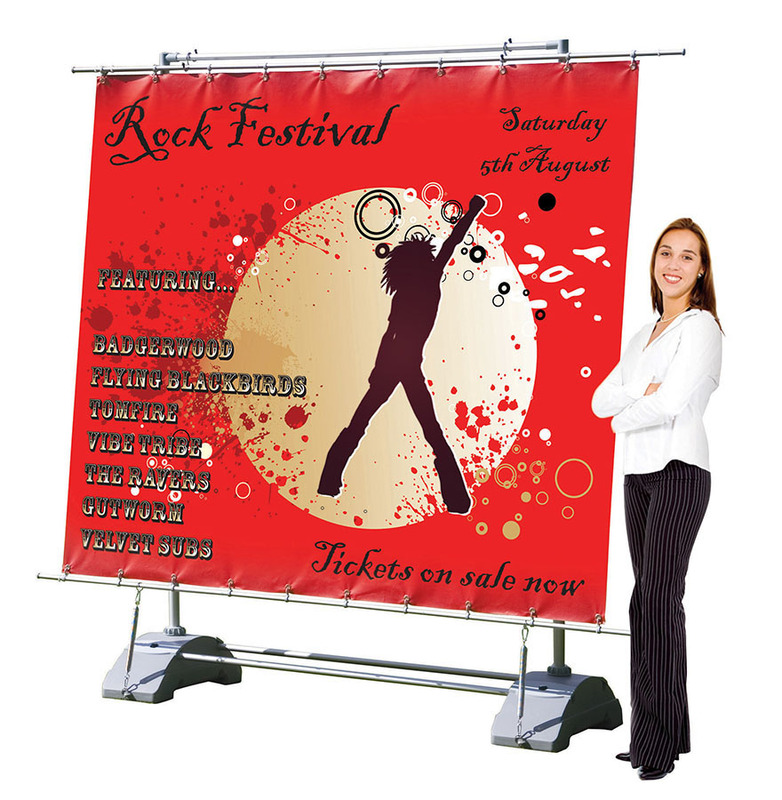 Custom printed with your artwork, they can create the ideal outdoor event display. Each size stands over 3m high, the inflatable arches provide the ultimate high-level branding which ensures your message stands out. 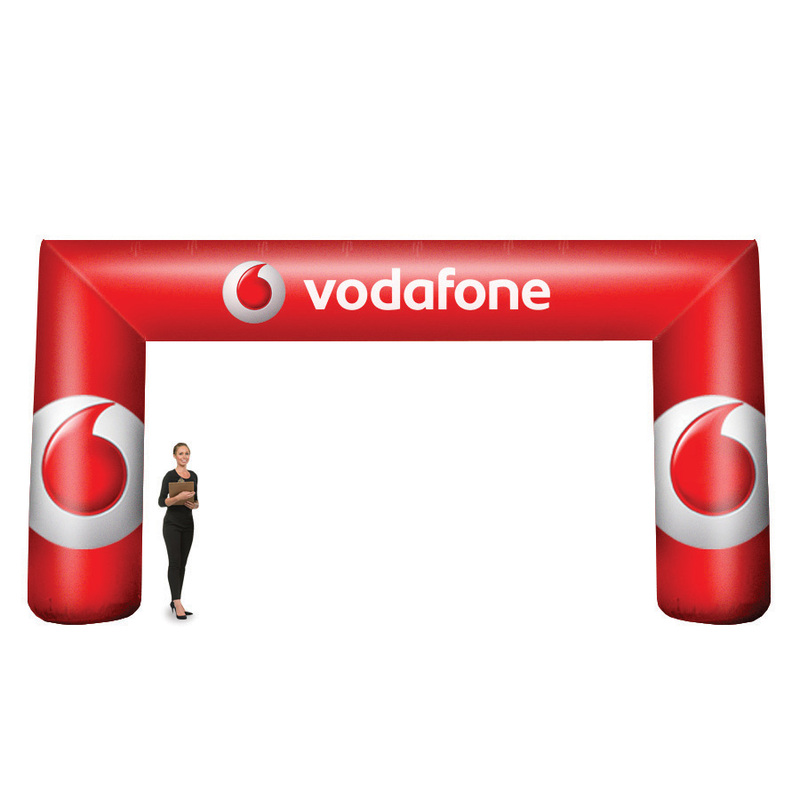 Designed to attract attention, the custom printed inflatable event arches are a great way to mark the start or finish line of a race, mark the entrance to an event, or quite simply just to better promote your brand. Our inflatable columns and advertising balloons are perfect for highlighting your brand and getting you noticed. Fully customisable across every inch of the inflatable structure. Inflatable advertising is ideal for outdoor events, supplied with everything you need to begin your outdoor advertising immediately. Printed flags are a visual and striking way to promote your business for both indoor and outdoor events. Custom printed flags are ideal for outdoor exhibitions, sporting events, country fairs and festivals. Our popular Zoom Lite Flags come in a range of shapes and sizes. Teardrop Flag, Crest Flag and Feather Flag are all available in 2.8m, 3.4m, 4.5m and 5.6m heights. The Zoom Lite Straight Flag comes in heights of 2m, 3m, 4m and 5m. Printed on a 115g polyester flag knit textile using the latest ‘Dye-Sublimation’ printing process. Dye-Sublimation is a process where full colour images, text and graphics can be transferred directly into a material, creating longer lasting, vibrant and detailed artwork. Available with a wide range of flag bases which can be used on hard or soft ground. Standing at 4m or 5m high, our Wind Dancer outdoor flag is perfect for creating a large branded display which will place you above your competitors. Complete with a hollow base which requires sand or water for weighing it down in outdoor applications. The Wind Dancer breaks down into manageable components and has the option of a carry bag for easy transportation. Our backpack flags are perfect for promoting your business on the move. Ideal for promoting events and festivals, charity awareness, your stand location at an exhibition or keeping your tour group together. Available in four different shapes – feather, quill, edge and X-banner. Your artwork or logo is printed directly onto the flag knit fabric which is attached to the back-pack hardware and is ready for immediate use. These banner stands are specially designed for outdoor use. Our outdoor banner range is waterproof, weather resistant and can be used whatever the weather. Most of the outdoor banners feature a hollow base which can be weighted down with sand or water so that it is stable in different weather conditions. The popular Monsoon Outdoor Banner is a landscape 'A' frame banner suitable for outdoor events where a large format outdoor display is required for effective brand promotion. Manufactured from a lightweight, aluminium frame with a large printed PVC graphic. Effortlessly assembled with an easy to use push fit assembly, the printed graphic is attached to the frame with elastic bungee cords. Available in two sizes -2500mm and 3000mm wide. Our Horizon Outdoor Banner is the largest of the range. A popular choice for advertisements at exhibitions, on sporting fields or in public areas such as shopping centres or airports. The large format banner stands at 2m high and 2.5m wide, this banner stand has hollow feet that can be filled with sand or water. Once weighted down it can withstand winds of 10-12mph (16-19kph). Storm Hydro outdoor banner stand is available single or double sided. Printed graphics are held in place by a simple eyelet system which provides a tensioned graphic display, perfect for a professional looking brand promotion. Built for durability and strength, the Storm Hydro is suitable for both indoor and outdoor events. The hollow moulded base can be filled with water or sand making it especially suitable for high traffic areas, and allows use in wind speeds of 10-12mph (16-19kph). Typically used outside businesses such as cafes, pubs, restaurants, bars, shops, markets, garages and retail premises. Pavement signs are perfect for running special offers, sales, promotions, launching a new product, deal or offer of the day. Suitable for a wide range of applications, but also ideal for use at exhibition and events as a directional signage, pointing and guiding people in the right direction. One of our bestselling outdoor pavement signs is the whirlwind. Ideal for displaying posters outside, garages, petrol stations, shops, business premises and on pavements and forecourts. The spring-loaded sign and weighted base mean it is able to withstand winds up to approximately 15-18mph making it suitable for typical English weather. Our Booster A frame sign features a header panel which is ideal for displaying your logo and branding. The poster sections below are ideal for promotions and offers and are available in 3 different sizes. The double-sided pavement sign means your branding and promotions can be seen from both angles ensuring maximum visibility from passing customers. A frame pavement signs are a popular and cost-effective outdoor pavement sign. Available with silver or coloured frames, and all options can come with full colour printed posters – perfect for promoting your products or services. The hardwearing aluminium frame features a heavy-duty steel back panel which offers stability and durability when in use. This A Board is sturdy and stable and folds away easily for storage. For more information about our outdoor event solutions or for help with selecting the right outdoor display for you, please contact us or call us on 01733 511030.